Background: Dermatoglyphics are the patterns of the skin ridges on pads of fingers which constitute a person's fingerprints. Several studies have shown that there exists a relationship between dermatoglyphics and dental diseases and conditions such as dental caries, periodontal disease, and malocclusion. The study aimed to determine the relationship between dermatoglyphics and tooth loss. Materials and Methods: The study comprised 100 patients, including fifty dentulous and fifty edentulous participants. The fingerprint patterns of the participants were recorded by a single investigator with a rolling impression technique using duplicating ink on an executive bond paper. Dermatoglyphic patterns of all ten palmar digits were recorded using Cummins and Midlo method. The level of significance was set as P < 0.05. Results: The study showed that in dentulous patients, there was a highest prevalence of whorl pattern (50.8%), followed by ulnar loop (45.2%), radial loop (3.2%), and arch (0.8%) patterns. The prevalence of pattern was similar for edentulous patients; however, the prevalence of whorls reduced to 49.8%, ulnar loops to 37.4%, and radial loops to 2.8% whereas the prevalence of arch patterns increased to 10%. Conclusion: The whorl pattern was the most prevalent pattern among both dentulous and edentulous patients followed by ulnar loop pattern. The present study showed that ulnar loop pattern was most prevalent in the fifth digit of both right and left hands of edentulous patients whereas the ulnar loop was prevalent in the third digit of both right and left hands of dentulous patients. Human skin, the largest organ of the human body, performs various vital functions in life. The palms of hand and soles of the feet are covered with two totally distinct classes of marks. The most conspicuous are the creases or folds of the skin which interest the followers of palmistry. Dermatoglyphics are the patterns of the skin ridges on pads of fingers which constitute a person's fingerprints. The term was coined in 1926 by Cummins and Midlo, although Cummins is considered to be the father of dermatoglyphics. Toward the end of the 19th century, Galton put forth a rule called “proof of no change,” which states that an individual's dermatoglyphics remain unchanged throughout his or her lifetime. Due to their unique nature, studying them can determine a number of parameters, which could be helpful in diagnosing and treatment of examined individuals. Thus, it is considered to be an important tool in assessing the genetic trait, evaluation of children with suspected genetic disorders, and also forensics., The ridged skin is considered to be a sensitive indicator of intrauterine dental anomalies as it originates from fetal volar pads similar to the teeth which also originates from the same ectodermal layer in the 6th–7th week of embryonic life. Hence, when an intrauterine dermal change occurs, a tooth anomaly can be expected. The basic patterns are whorls, arches, and loops; however, the size, spacing, and shape give them their distinct personality. In the recent past, a number of investigators have focused their attention in finding out an association of morphological and genetic characteristics with a number of pathological conditions. In a study conducted by Sharma and Somani, patients with dental caries had a positive correlation with the loops (decreased frequency of loops) and growth of Streptococcus mutans. In a study conducted by Saxena et al., 48 cleft participants and 50 healthy controls with both their parents were evaluated and they found increased frequency of loops and arches and low mean total ridge count in cleft participants. They also found increased frequency of loops and arches with decreased frequency of whorls and mean total ridge count. Although edentulism has been described to be on the decline in many developed countries, tooth loss continues to be a major public health problem globally, and causes of tooth extractions had large geographical and cultural differences among various regions in a country and from one country to another. The research regarding dermatoglyphics and tooth loss is still in its early stages. Hence, if such a relationship is established between dermatoglyphics and tooth loss, early detection can aid the clinician to anticipate health problems in adults and initiate preventive and protective measures at the earliest. Until now, there exists no literature pertaining to the relationship between dermatoglyphics and tooth loss. Hence, the current study was conducted to assess the relationship between dermatoglyphics and tooth loss. Before the start of the study, approval was obtained from the institutional ethics committee. Written informed consent was obtained from all the participants. Before the start of the procedure, the hands of the participants were cleaned using antiseptic lotion and water to remove sweat, oil, or dirt from the palmar surface and allowed to dry. 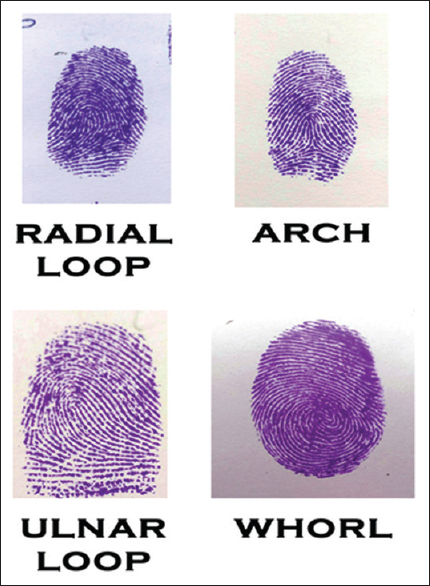 The fingerprint patterns of the participants were recorded by a single investigator with a rolling impression technique using duplicating ink on an executive bond paper. The investigator was trained in recording the fingerprints before the start of the study at the department of public health dentistry under the guidance of an expert. Dermatoglyphic patterns of all ten palmar digits were recorded using Cummins and Midlo method. All ten fingers of a single participant were studied under adequate light and magnification using a ×10 magnifying glass and classified into three basic types according to shape, whorls, loops, and arches. Loop pattern was subdivided into ulnar loop and radial loops. Ulnar loop pattern composed of ridges which open to the ulnar side and radial loop pattern composed of ridges which open to the radial side [Figure 1]. The data were entered into Microsoft Excel spreadsheet. Statistical analysis was done by SPSS software, 18 version (IBM, Chicago, Illinois, USA). The intergroup data were analyzed using the Chi-square test and the level of significance was set as P < 0.05 with a confidence level of 95%. A total of 50 dentulous and 50 edentulous patients participated in the study. 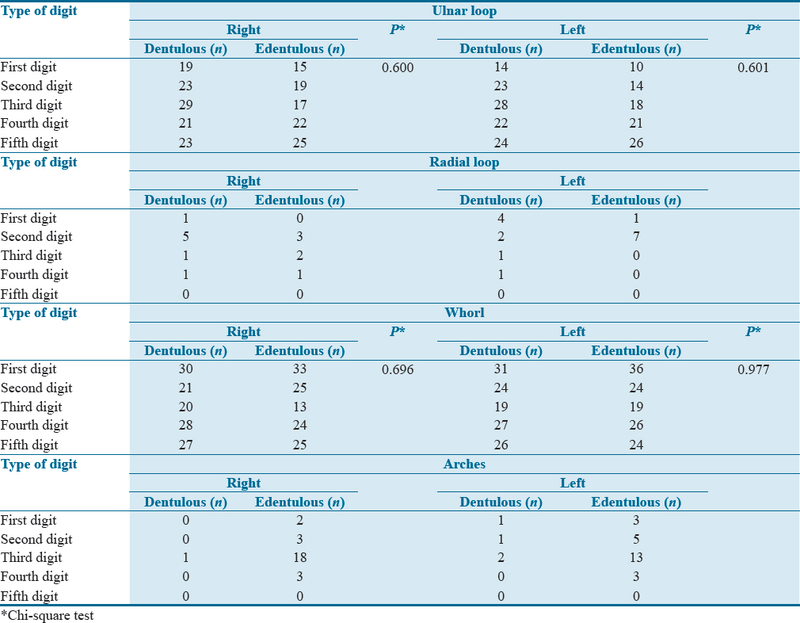 The frequency distribution of all pattern types on fingertips of dentulous and edentulous patients was assessed [Table 1]. It was found that in dentulous patients, there was a highest prevalence of whorl pattern (50.8%), followed by ulnar loop (45.2%), radial loop (3.2%), and arch (0.8%) patterns. The prevalence of pattern was similar for edentulous patients; however, the prevalence of whorls reduced to 49.8%, ulnar loops to 37.4%, and radial loops to 2.8% whereas the prevalence of arch pattern increased to 10%. The frequency distribution of all pattern types on individual fingertips of dentulous and edentulous patients was assessed [Table 2]. The ulnar loop pattern was highest in the fifth digit of both right and left hands of edentulous patients, whereas in dentulous patients, the ulnar loop pattern was highest in the third digit of both right and left hands. The difference was found to be statistically not significant. The whorl pattern was highest among both edentulous and dentulous patients in the first digit of both right and left hands. The difference observed was not statistically significant. It was noted that the highest prevalence of arch pattern was found on the third digit of the right hand among dentulous patients which was similar to that of dentulous patients. In dentistry, dermatoglyphics has been studied in cleft lip and palate, hereditary gingival fibromatosis, periodontal diseases, dental caries, dental malocclusions and potentially malignant disorders (oral submucous fibrosis, leukoplakia, and oral cancer), malignant disorders. and aphthous ulcer of the oral cavity.,,,, Genetic or chromosomal abnormalities might be reflected as alterations in dermal ridges; they can be readily used as an accessible tool in the study of genetically influenced diseases. In the present study, it was found that the most common fingerprint among dentulous and edentulous patients was whorl pattern. The least common fingerprint was arch pattern among dentulous patients and radial loop pattern among edentulous patients. The study showed that arch pattern was ten times more prevalent in edentulous patients when compared to dentulous patients in the third digit of both hands. The dearth of published literature on dermatoglyphics and tooth loss is a limitation for the present study. To date, this is the first study conducted to determine the relationship between dermatoglyphics and tooth loss across the globe. Finger patterns are genotypically determined and remain unchanged from birth till death. Dermatoglyphics has shown to be a cheap and noninvasive tool for early detection of various dental diseases. The present study showed that the whorl pattern was the most prevalent pattern among both dentulous and edentulous patients followed by ulnar loop pattern. The difference observed was not statistically significant which could be attributed to the small sample size. The study showed that the ulnar loop pattern was most prevalent in the fifth digit of both right and left hands of edentulous patients whereas the ulnar loop was prevalent in the third digit of both right and left hands of dentulous patients. The difference observed was not statistically significant. Future studies on diverse and larger population would perhaps provide a conclusive relationship between dermatoglyphics and tooth loss. The authors would like to thank Mrs. Nisha Kurien, Statistician, Pushpagiri Institute of Medical Sciences, Tiruvalla, Kerala, for the help in completing the statistical analysis of the study. Madan N, Rathnam A, Bajaj N. Palmistry: A tool for dental caries prediction! Indian J Dent Res 2011;22:213-8. Sharma A, Kapoor PD. Dermatoglyphics, dentistry and diagnosis – A review. Baba Farid Univ Dent J 2010;1:45-8. Venkatesh E, Bagewadi A, Vaishali K, Aravind S. Palmar dermatoglyphics in oral leukoplakia and oral squamous cell carcinoma patients. J Indian Acad Oral Med Radiol 2008;20:94-9. Kimura S. Embryologic development of flexion creases. Birth Defects Orig Artic Ser 1991;27:113-29. Stosljević M, Adamović M. Dermatoglyphic characteristics of digito-palmar complex in autistic boys in Serbia. Vojnosanit Pregl 2013;70:386-90. Kamboj M. Dermatoglyphics. Br Dent J 2008;204:51. Namouchi I. Anthropological significance of dermatoglyphic trait variation: An intra-Tunisian population analysis. Int J Mod Anthropol 2011;4:12-27. Atasu M, Akyuz S. Congenital hypodontia: A pedigree and dermatoglyphic study. J Clin Pediatr Dent 1995;19:215-24. Bhat PK, Badiyani BK, Aruna CN, Chengappa S, Bhasker NN. Dermatoglyphics: A new diagnostic tool in detection of dental caries among deaf and mute children. Int J Clin Dent Sci 2011;2:80-4. Ceena DE, Ahmed J, Shenoy N, Binnal A. Dermatoglyphics in dentistry – A review. Int J Curr Res Rev 2013;5:30-3. Sharma A, Somani R. Dermatoglyphic interpretation of dental caries and its correlation to salivary bacteria interactions: An in vivo study. J Indian Soc Pedod Prev Dent 2009;27:17-21. Saxena RS, David MP, Indira AP. Dermatoglyphic evaluation in subjects and parents of cleft lip with and without cleft palate. Cleft Palate Craniofac J 2013;50:e105-10. Al-Shammari KF, Al-Ansari JM, Al-Melh MA, Al-Khabbaz AK. Reasons for tooth extraction in Kuwait. Med Princ Pract 2006;15:417-22. Cummins H. Revised methods of interpretation and formulation of palmar dermatoglyphics. Am J Phys Anthropol 1929;12:415-502. Mathew L, Hegde AM, Rai K. Dermatoglyphic peculiarities in children with oral clefts. J Indian Soc Pedod Prev Dent 2005;23:179-82. Ahmed RH, Aref MI, Hassan RM, Mohammed NR. Dermatoglyphic study on patients with dental caries who wearing dental fillings and its correlation to apoptosis that induced by using dental fillings. Natl Sci 2010;8:54-7.
predictive Reddy S, Prabhakar AR, Reddy VV. A dermatoglyphic and comparative study of class I, class II, div 1, div. 2 and class III malocclusions. J Indian Soc Pedod Prev Dent 1997;15:13-9. Skrinjarić I, Bacić M. Hereditary gingival fibromatosis: Report on three families and dermatoglyphic analysis. J Periodontal Res 1989;24:303-9. Atasu M. Dermatoglyphic findings in periodontal diseases. Int J Anthropol 2005;20:63-75. Tikare S, Rajesh G, Prasad KW, Thippeswamy V, Javali SB. Dermatoglyphics – A marker for malocclusion? Int Dent J 2010;60:300-4. Latti BR, Kalburge JV. Palmistry in dentistry. J Adv Med Dent Sci 2013;1:25-33. Shuler CF. Inherited risks for susceptibility to dental caries. J Dent Educ 2001;65:1038-45. Schaumann B, Alter M. Dermatoglyphics in Medical Disorders. New York: Springer Verlag Publishers; 1976. p. 27-87.